The JD Hobson Band's newest release is roots perfection, fusing Americana and Delta country blues together in an upbeat rockin' package. JD Hobson has a large repertoire of upbeat Americana and Country Blues which is enjoyed by his strong following. 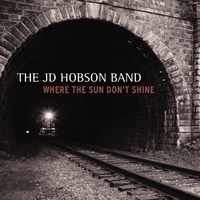 The JD Hobson Band is the natural evolution of JD's solo career in the Seattle area. Made up of three members, the band brings even more energy and depth to the upbeat, soulful music their fans have come to love. Whether it’s their rockin’ version of Son House’s “Preachin’ the Blues” or the true Americana flavor of JD's original song, "Where the Sun Don't Shine," their music has been known to get the whole place dancing. As the winner of the South Sound Blues Association’s Back to Beale Street solo/duo competition, he recently competed in Memphis at the 2011 International Blues Challenge for the second year in a row. Fantastic! I haven't stopped listening to this album for a week. 13 songs and every one is a gem! Diverse and authentic, yet every number is personal and inspired. If you like roots and blues I know you'll love this one.